(TORONTO, ON. – September 15, 2014) It’s the vehicle that made hybrid ownership mainstream – the most recognizable hybrid in the world. With advanced features and exceptional performance, the 2015 Toyota Prius is ready to deliver remarkable fuel efficiency and emissions performance – plus a whole lot more – to Canadian drivers. Since its introduction to Canada in 2000, the Prius has proven that Toyota hybrids offer all of the quality and reliability that Canadian drivers demand, plus the exceptional fuel efficiency and advanced driving experience that only a Toyota hybrid can deliver. The Prius has won back-to-back Retained Value Awards from Canadian Black Book (2013-2014) in its category. It’s recognized by Natural Resources Canada as the country’s most fuel efficient mid-size car. It’s one of the 10 Best Green Cars for 2014, as selected by Kelley Blue Book. With the 2015 Prius, drivers enjoy advanced acceleration, braking and ride comfort – plus terrific fuel efficiency and low emissions – thanks to Toyota’s Hybrid Synergy Drive. The most proven hybrid system on the planet, the Hybrid Synergy Drive is specially configured for each Toyota hybrid. In the 2015 Prius, the system is built around a highly efficient Atkinson Cycle 1.8L 4-cylinder engine with a lightweight aluminum alloy block, a high-torque electric motor, high-capacity storage battery and sophisticated power management system. This combination delivers 134 net system horsepower and seamlessly shifts between gas engine, electric motor, or a combination of the two to maximize power and efficiency at every speed, under any driving condition. Coupled to a continuously variable transmission, the result is impressive torque for smooth and confident acceleration through a large speed range, remarkable fuel efficiency of 4.7 L / 100 KM (city/highway combined)*, and tailpipe emissions that are a fraction of those from a conventional mid-size vehicle. The Hybrid Synergy Drive also enables many features unique to hybrids, from the added power and efficiency of regenerative braking to four driver-selectable driving options (Normal, Power and ECO plus Electric Vehicle operation for short distances) to suit any style and driving condition. Hybrid-powered comfort, convenience and style features include an automatic in-cabin temperature control system, an ECO Drive monitor, Touch Tracer steering wheel-mounted controls for HVAC and audio systems, and more. Additional standard features include: a six-speaker, 6.1” display audio system; Bluetooth connectivity for personal electronics; power door locks with touch-sensitive driver door handle lock/unlock and key lockout protection features; the Toyota Smart Key System with Push Button Start; power windows with auto up/down function on all windows; tilting/telescoping steering column; map lamps; power adjustable heated exterior mirrors; 15” aluminum alloy wheels with locks; and more. Safety is always standard on a Toyota, so every 2015 Prius features seven airbags plus Active Front Headrests with Whiplash Protection, front seatbelt pre-tensioners and force limiters, anchor points for child seats, child protector rear door locks, an LED rear high mount stop lamp, and a direct tire pressure monitoring system. As with every new Toyota since 2011, the 2015 Prius is also standard equipped with the six active safety technologies of the Star Safety System: Antilock Brake System, Brake Assist, Electronic Brake Force Distribution, Vehicle Stability Control, Traction Control and Smart Stop Technology work together to help drivers avoid potential accident situations. The Moonroof Upgrade Package adds: a navigation system with advanced voice recognition; enhanced audio system with SMS to Speech and Email to Speech capabilities; integrated XM Satellite Radio; integrated garage door opener; a power moonroof with integrated solar panels; and touch sensitive lock/unlock feature on the front passenger door handle. The Touring Package enhances the Prius with numerous including: navigation system with advanced voice recognition; enhanced audio system with SMS to Speech and Email to Speech capabilities; integrated XM Satellite Radio; integrated garage door opener; touch sensitive lock/unlock feature on the front passenger door handle; synthetic leather seats; an eight-way power adjustable driver’s seat; heated front seats; LED headlamps; the auto leveling headlamp system; headlamp washers; fog lamps; and 17” aluminum alloy wheels. The Technology Package turns the Prius into an advanced technology showcase, adding powerful and useful Toyota technologies such as; dynamic radar cruise control; the Toyota pre-collision system; the AVN Premium Navigation System; and an eight-speaker Premium JBL Audio System. Other features in this package include: integrated XM Satellite Radio; integrated garage door opener; a power moonroof with integrated solar panels; touch sensitive lock/unlock feature on the front passenger door handle; synthetic leather seats and synthetic leather-wrapped steering wheel; an eight-way power adjustable driver’s seat; heated front seats; and a rear bumper protector. The 2015 Toyota Prius is now on sale at Toyota Dealers across Canada. 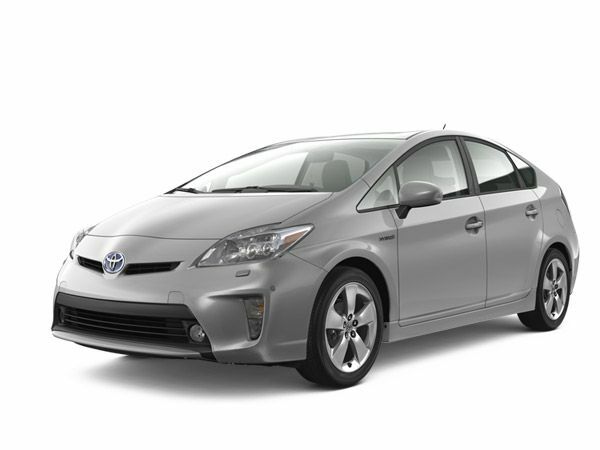 For more information on features and specifications, visit toyota.ca/prius.